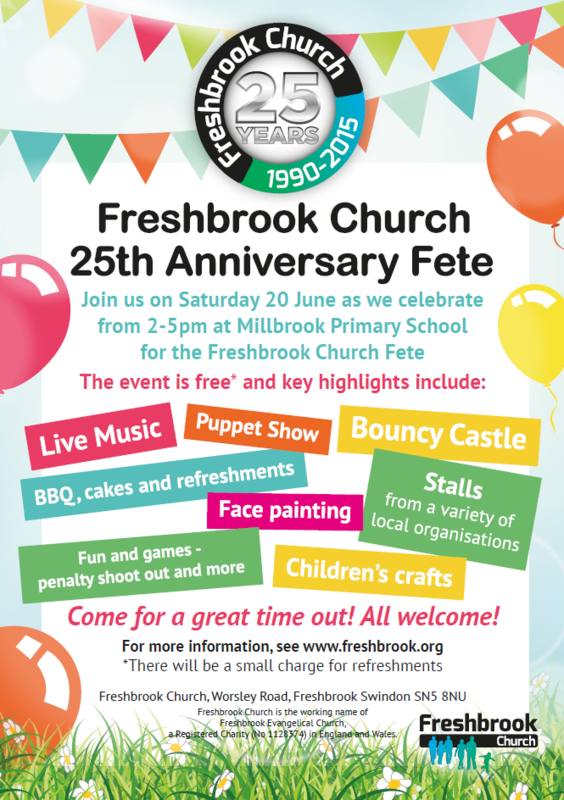 Come and celebrate with us the 25th anniversary of Freshbrook Church! We are planning a great fun day and all are welcome! It’s on 20th June, between 2-5pm on Millbrook Primary School grounds, Freshbrook. From a bouncy castle to face painting, from welly wanging to penalty shootout, net-a-duck, a coconut shy, children’s craft and lots more… there will be plenty for everybody to enjoy. And it’s all free! Update: There will also be archery, hosted by the Cubs! We have some real treats in store for you! There will be live performances by a number of local schools: Millbrook, Lydiard Park Academy and Tregoze. There will also be music by our own young people as well as puppet shows. Various groups will be showcasing the work they do for the benefit of the community, such as Brownies and the Swindon Choral Society. We’ll also be on hand to talk about our work within the local community and how we can help and support you. The local Fire Brigade will be bringing a fire engine – a real attraction for the kids! There will be delicious hot dogs and burgers, cakes and drinks; plenty for all to enjoy and all at modest costs. We’ve also organized an ice cream van for the day. As the days progress we will post more details, so do visit this page from time to time. (Details subject to change). The celebrations doesn’t end here! We are very pleased to announce that our former pastor, Peter Grainger, will be coming especially to preach on this very special occasion. The service is opened to all. It promises to be a great evening for all! Oh yes, did we mention cakes? Yes, cakes, lots of cakes, and hot drinks – coffee, tea, hot chocolate … And it’s all free!